So anyway. Was sitting in the pub last night, after 5-a-side footy, and my friend Sean related the above query, spotted in yesterday's Metro newspaper. It kept us going for at least 30 minutes. 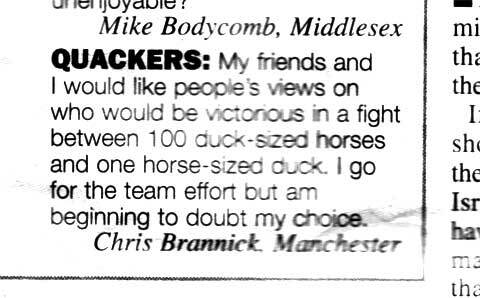 "The answer to Chris Brannick's query about who would win a fight between 100 duck-sized horses and one horse-sized duck (8/10/03) is clearly dependent on terrain, but my friends and I feel the superior head-mounted, laser guided weaponry employed by the horses should tip the balance in their favour."